What is a pinata? It is a pretty box decorated with the shape that we want, and which contains candies and confetti. Hang it in the air, on the ceiling or a tree branch for example, and destroy it with baseball bats, to recover the delicious treasure it contains! It's the perfect animation for a birthday party or birthday party. Pinatas are always a blast to have at any party, giving you a fun activity that all ages enjoy. Simple and inexpensive, the pinata is an easy way to really make your party special and with the spring time coming up, it is the perfect time to throw an outdoor event. Finding a store that sells pinatas can be difficult but fortunately for you, making a pinata is a relatively uncomplicated project. 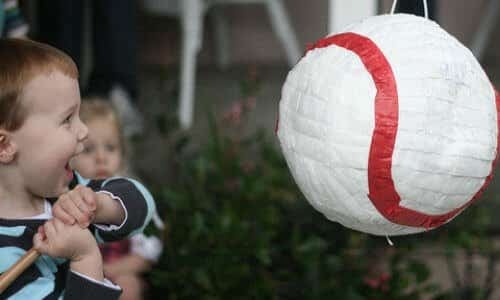 Check out this quick how-to to make your very own baseball pinata. 1. Inflate the balloon to size you want your piñata to be and tape any cardboard or construction paper shapes to the sides. 2. Mix one part flour and two parts water in a bowl until it becomes paste. 3. Using strips of torn paper that are dipped into the paste, cover your piñata. 4. Repeat Step 3 at least two more times using a different type of paper (ie. newspaper, construction paper, etc. ), each time ensuring the piñata is dry before the next layer is applied. 5. Allow the piñata to dry until it is no longer sticky or wet to the touch and is hard and dry. in red and white to decorate the outside, and use your metallic gold marker to decorate or write “happy birthday” on the ball. Now all you have to do is pop the balloon on the inside to fill with candy and/or other treats and enjoy!